Antique Austrian Coffeehouse Chess Pieces. 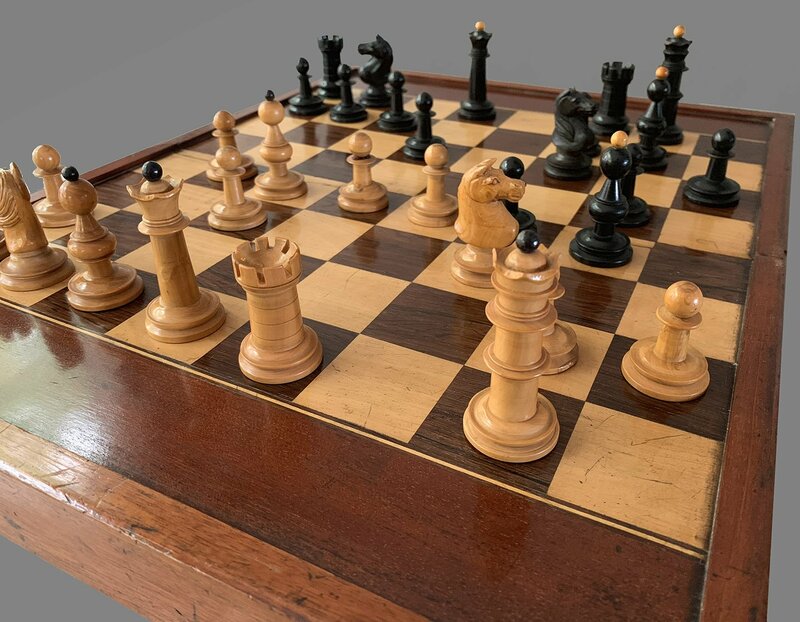 Here is a very desirable set of Antique Austrian Coffeehouse Chess Pieces, Boxwood and Ebony, unweighted, circa 1880-1900. 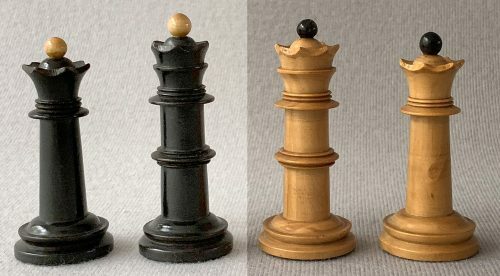 A notable feature of these popular chessmen was the opposite colored finials on the Kings, Queens and Bishops. These late 19th-century Austrian coffeehouse chess sets, also known as Old Vienna or Viennese Coffeehouse chess sets, have an elegant charm and had a ubiquitous presence through parts of Europe during the latter part of the 19th Century and into the early 20th Century. This set of Antique Austrian Coffeehouse Chess Pieces is a fine example. The King stands 2.8″ tall with a 1.2″ diameter base. The chessmen are in excellent condition with a very attractive patina on the Boxwood. One Boxwood Bishop has a small hairline shrinkage crack near the base. The antique chessboard shown is not included, but a suitable chessboard can be found here. The design of the Austrian Coffeehouse chess pieces is certainly influenced by Staunton pattern. The chessmen are very durable with few, if any weak areas in the design which could be broken during spirited handling. The Austrian Coffeehouse chess pieces are quite stable on the chessboard and, as a result, these sets are quite playable. These chessmen became the standard fare in Central Europe – the lands of the Austrian monarchy as well as Germany , Switzerland , and Northern Italy. Major tournaments like Vienna 1898, Semmering 1927 and Karlsbad 1929 were played using these chess pieces. 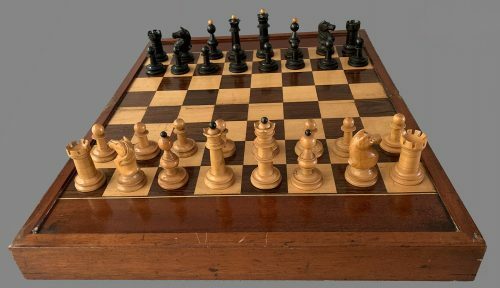 These chess sets were produced in sizes from 2″ to well over a 5″ King. They had base pads, but were normally not weighted. The popularity of these sets seemed to have waned after World War ! !, but are still seen today in some European venues.